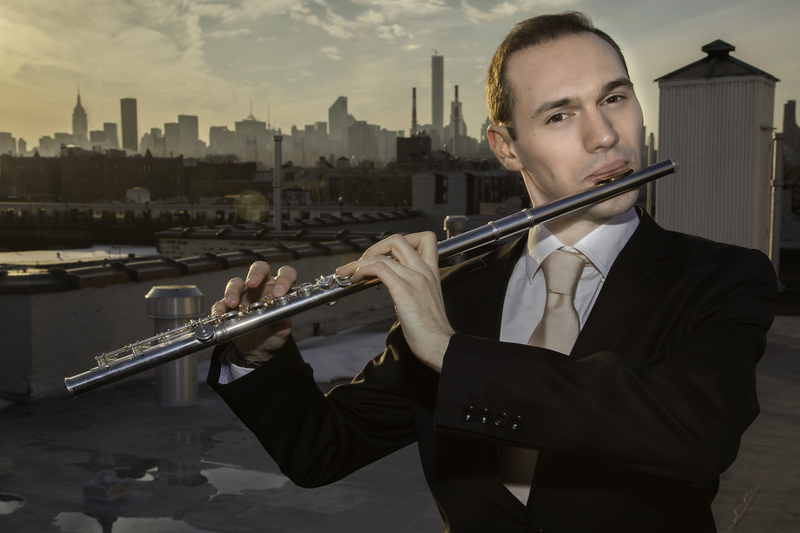 Praised for his “lustrous tone” (Musical America) and his “full tone, exacting articulation and interpretive intelligence” (New York Classical Review), Italian flutist Giorgio Consolati is a sought-after soloist and chamber musician. Giorgio has recently appeared on stage in David Geffen Hall performing Christopher Rouse’s Flute Concerto with Maestro Alan Gilbert and the Juilliard Orchestra. Highlights of Giorgio’s upcoming projects include solo and orchestral performances with Symphony in C and the Juilliard Orchestra, along with a recital for New York City’s Salon de Virtuosi. Giorgio will also perform at the Marlboro Festival for several chamber music performances in the summer of 2019 in addition to touring six cities with Musicians from Marlboro in 2020. As a passionate solo flutist, Giorgio has appeared as a soloist with the National Repertory Orchestra in Breckenridge, and the Verdi Conservatory Orchestra in Milan. In addition to his solo appearances, Giorgio is a winner of many competitions including the 9th De Lorenzo International Flute Competition, and first prize winner of the Emanuele Krakamp Flute Competition, Alexander & Buono Flute Competition and the National Society of Arts and Letters Woodwind Competition. Giorgio is also a multiple time Friends of Flutes Foundation grant awardee. As a member of the Juilliard Orchestra, Giorgio has served as principal flutist in major concert halls in New York City, including Carnegie Hall, Alice Tully Hall and the Peter Jay Sharp Theater under the batons of Alan Gilbert, Gianandrea Noseda, Peter Oundjian, Speranza Scappucci, Gerard Schwarz and David Zinman. A particular highlight was his performance of Debussy’s Prélude à l’après-midi d’un faune under the baton of David Robertson in David Geffen Hall. Giorgio has also been recently appointed associate principal flute of Symphony in C.
Passionate about contemporary music, Giorgio regularly performs with AXIOM and New Juilliard Ensemble. Recent highlights include premieres at Juilliard’s Focus Festival and a solo performance of Berio’s Sequenza I in Alice Tully Hall, which was praised by George Grell of the New York Classical Review: “Consolati played with an agile mind, expressing his ideas about the music through the shape of his phrases and the way he vigorously drove through each line.” Giorgio has also performed at the distinguished contemporary festival Milano Musica, where his performances were broadcasted by the premiere Italian classical radio station, Rai Radio 3. An avid chamber musician, Giorgio was heard with various ensembles in Lincoln Center’s Morse and Paul Hall, as well as during ChamberFest at The Juilliard School. He has also performed at festivals such as the Marlboro Music Festival and the Norfolk Chamber Music Festival. A native of Milan, Giorgio is the first flutist in his hometown Conservatory’s 211-year history to graduate with top honors and honorable mention. Giorgio studied with several of Italy’s premier flutists including Paola Fre, Nicola Mazzanti, and Chiara Tonelli. He is now finishing his Master of Music degree at The Juilliard School under the tutelage of Carol Wincenc, where he is a proud recipient of a Kovner Fellowship. Giorgio has also participated in masterclasses given by renowned flutists such as Maxence Larrieu and Patrick Gallois, and was a scholarship participant at Sir James Galway’s and Marina Piccinini’s International Masterclasses. When not blazing through the flute repertoire, Giorgio enjoys going to art exhibitions, traveling, and trying new cuisines!